Teams from Regina’s outdoor hockey league will get a taste of indoor hockey on February 27th and 28th, 2004 when they participate in a World Cup style hockey tournament. 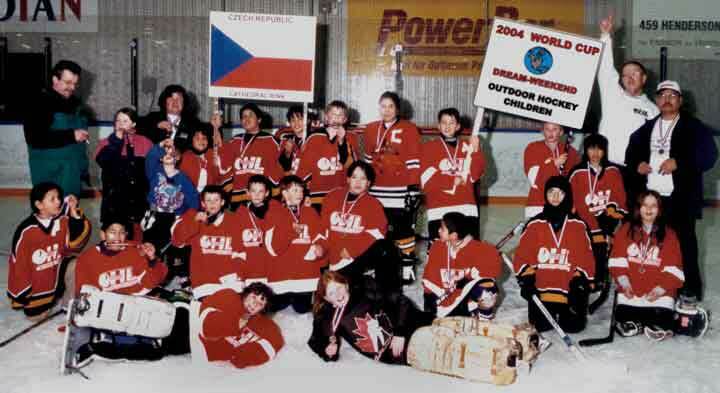 The 2004 World Cup Dream Weekend was organized by a group of Regina volunteers. The group’s spokesman, Ken Jones, has been a volunteer with the league for ten years. and I hear them say, that one day they wish that could play hockey in arenas like other children do. This weekend will be a dream come true for over 350 inner-city youth, boys and girls, ages 7-16, of every creed and colour. “We want to give these kids an opportunity to dream that they are playing in an international hockey tournament”. The organizing committee has raised funds for the tournament so there will be no cost for the players. Each player will receive a gold medal in recognition of his or her dedication to outdoor hockey. Mr. Jones was chosen “ Volunteer of the Year " by the City of Regina in 1998 in recognition of his commitment and dedication as a volunteer. He is an active volunteer in numerous organizations, including the Regina Outdoor Hockey League, Regina Y’s Men’s Club, the Cathedral Area Arts Festival, and the Maritimer’s Club of Regina.